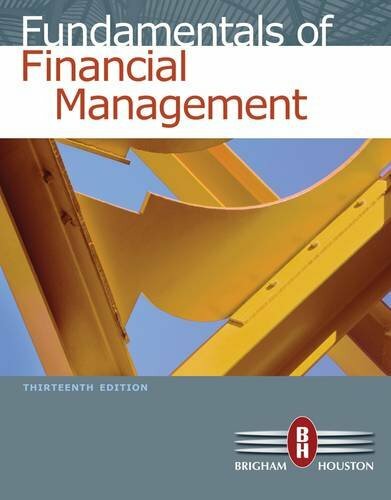 With the same contemporary approach and dynamic examples that made previous editions so popular, this fully revised thirteenth edition of FUNDAMENTALS OF FINANCIAL MANAGEMENT continues to provide students with a focused understanding of today's corporate finance and financial management. ten textbooks on managerial finance and managerial economics that are used at more than 1,000 universities in the United States and have been translated into 11 languages worldwide. He has testified as an expert witness in numerous electric, gas, and telephone rate cases at both federal and state levels. He has served as a consultant to many corporations and government agencies, including the Federal Reserve Board, the Federal Home Loan Bank Board, the U.S. Office of Telecommunications Policy, and the RAND Corporation. Dr. Brigham continues to teach, consult, and complete research in addition to his academic writing. He spends his spare time on the golf course, enjoying time with his family and dogs, and tackling outdoor adventure activities, such as biking through Alaska. also currently serves as an Associate Editor for the JOURNAL OF MONEY, CREDIT AND BANKING, the JOURNAL OF FINANCIAL SERVICES RESEARCH and the JOURNAL OF FINANCIAL ECONOMIC POLICY. Since arriving at the University of Florida in 1987, Joel has received 19 teaching awards, and has been actively involved in both undergraduate and graduate education. In addition to co-authoring leading textbooks in financial management, Dr. Houston has participated in management education programs for the PURC/World Bank Program, Southern Company, Exelon Corporation and Volume Services America. Joel enjoys playing golf and tennis and spending time with his wife (Sherry) and two children (Chris and Meredith). He is an avid sports fan who follows the Florida Gators, and the Pittsburgh Steelers, Pirates and Penguins.